I never thought a salad would be THE HIT of my Thanksgiving table. Never. It’s just a bunch a lettuce for goodness sake! This salad had my guests moaning and groaning like they had never had a salad before! I make a moist and juicy turkey that melts in your mouth! My Spiced Roasted Winter Vegetables were in the Los Angeles Times! A Salad? Well, this isn’t just any salad. Remember my little winter garden I started? Those little lettuce plants have blossomed into my own organic farm. Yes, I am being dramatic, as I have three tiny rows of lettuce and one row of beets, but it’s a start! I really enjoy walking out of my door, and picking greens ten minutes before my family eats them. The 4 year old loves for me to wash a few leaves and just hand them to her. . . nothing additional needed. I also have my neighbors organic persimmon tree to raid. My food blogger friend Greg recently made a Fuyu Persimmon Salad with Arugula and Pomegranate, which sounded so delicious. I hadn’t thought of using the fruit in a salad before. I have made Persimmon Cookies and Persimmon Ice Cream, but never a salad. His salad inspired me in my choice of flavors for my salad, but I promised him I wouldn’t copy him. Well, I did use pomegranate too. . . The other influencing factor in this salad coming into being is a sample of Honey Ridge Farms Spiced Honey Creme I recently received. This honey is outrageous! Cinnamon, a hint of clove and anise, sweet honey. Wow! 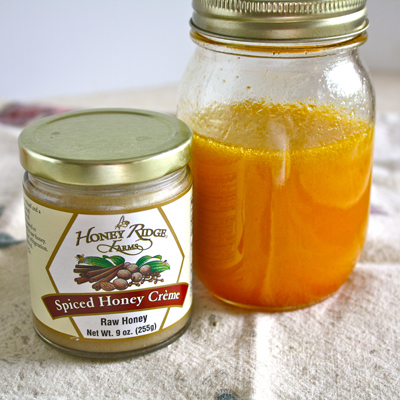 I actually had to cut my mother off from the honey so I would have enough to test and make the recipe! Last night I had some drizzled onto warm, crumbled, buttered cornbread, which I then ate with a spoon. So good. I knew this honey would pair really well with the persimmon. I decided to add a shot of sriracha sauce to balance all of the sweetness of the fruit. Sriracha, also known as Rooster sauce because of the rooster on the label, is a potently hot sauce with a lot of flavor. A hot sauce with only heat is no good. You want a hot sauce with flavor too. This vinaigrette will go well with plain salad greens, arugula, or even drizzled over fruit only. The spices in the honey hit your tongue, then a bit of acid from the vinegar, and the sriracha adds a very subtle hit of heat right at the finish. A nicely balanced dressing that is a breeze to make. Please take a moment and sign up for the Black Girl Chef’s Whites Newsletter! 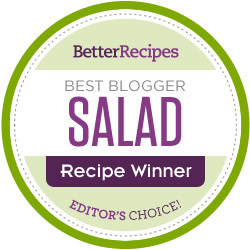 You’ll even find original recipes that won’t be published on the blog, along with food news and views! This colorful and nutrient rich salad makes a beautiful and delicious centerpiece for your dinner table! Place the salad greens onto a large serving platter or in a large bowl. 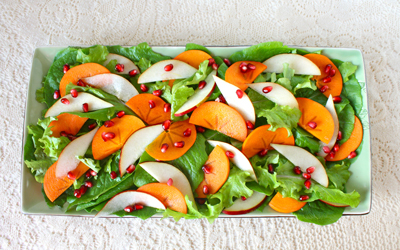 Arrange the sliced persimmon and pear on top. Sprinkle with the pomegranate seeds. 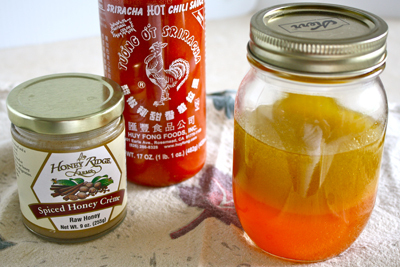 Combine the white balsamic vinegar, honey creme, sriracha sauce and salt in a small bowl. Whisk the ingredients, until the honey and salt are dissolved completely.While whisking, slowly drizzle the olive oil into the bowl, until the dressing is slightly thickened and emulsified. Immediately pour the desired amount of dressing onto the salad and serve.Refrigerate any unused dressing in a sealed container. Oh I love this salad, perfect fall flavors! And the dressing sounds yum. how fun!!!! 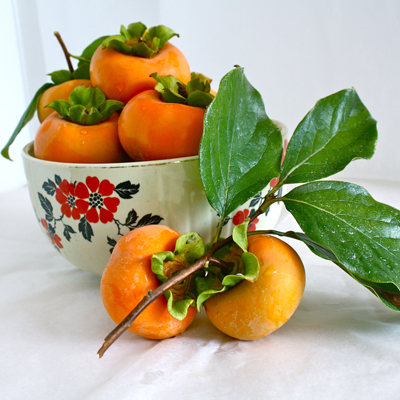 I have only had persimmons as fruit, by themselves. This salad sounds and looks delicious… I knew it was possible for a salad to upstage the turkey on Thanksgiving!!! Go Salad!!!! This sounds incredible! I will be trying it for sure – I can see you’re a Sriracha fan also – to me it adds a touch of wonderful, mysterious flavor! 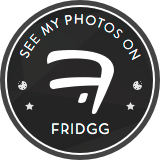 I love your blog and will have fun exploring it. Thanks!